Last year we wrote a post about one of our projects with Boat People, SOS, an organization that does incredible work in the Vietnamese community in the United States and abroad. They gave us the opportunity to go through the many boxes of archived letters and documents from Vietnamese refugees, many of whom are seeking asylum or family reunification. These primary sources are so incredible because they provide us with more clear and nuanced insight into the refugee application process, the appeal process, life in camp, the perception of refugees by local communities, the details of the journey to the refugee camp, and more. We are excited to begin sharing with you some of the documents and their respective translations, the first of which can be found below, in our new collection, #fromthearchives. Again, we are deeply grateful to BPSOS, especially the Youth Program Coordinator, Trung Nguyen, for allowing us to have access to these archives, and to the Vietnamese Studies Students at Southeast Asian Studies Summer Institute of University of Wisconsin-Madison (SEASII) for helping us translate some of the documents that didn't come with official translations. The following is a letter written on September 4th, 1995 by Phạm Việt Mạnh to various organizations detailing the unjust treatment of the refugees at the Sungei Besi Refugee Camp in Malaysia by the local police force. It also sheds light onto the reality that a refugee's hardship did not necessarily end once he or she arrived at a refugee camp, but more often than not, ushered in a different set of obstacles. It is important to note that at this time, tensions were exceptionally high due to changes in the policy for determination of refugee status coupled with (often forced) repatriation proceedings. *Sungei Besi Refugee Camp was located on the outskirts of Kuala Lumpur, Malaysia. It was established as a transit center in 1982, and officially closed in June of 1996. My name is Pham Viet Manh. ME 526028, ID 167246, a Vietnamese boat person living in Sungai Besi camp in Malaysia. Today I’m writing this letter to you because there are a number of legal issues I need your help with. As you also know, in the Sungibesi camp, a non-violent demonstration to demand political asylum broke out on the 23rd of January, 1995, due to the aspirations of all the refugee compatriots in Sungibesi, under the name of “the Unified Council of Asylum-seeking Refugees.” I am also one among the 2705 boat people that signed a petition letter to send to the Office of the UN High Commissioner for Refugees and responsible authorities for them to consider and resolve our problems. (The petition was sent on the 25th of February, 1995). this petition and hand it over on our behalf. Sir, throughout the entirety of this time when we have been awaiting a satisfactory response from the humanitarian organizations and those with the power to resolve our problems, we have always stuck to the principle of fighting for our rights peacefully and without violence. We only sit praying and hunger striking in on location. At 3:30 in the morning on 10 August, 1995, once again the local government brought in a special police force (FRU), around 4000 well-equipped police members swarmed the camp and beat us with unmatched ferocity, although at the time we were empty-handed and had no choice but to kneel down and pray – while some were in the process of hunger-striking! This event caused injuries to to hundreds of people including women and children, among those 16 were seriously injured and a number had head trauma. After they had used violence to oppress our movement, they herded back to our own separate areas and after that they erected fences of interlacing barbed wire to divide us up into isolated areas. Now we are confined behind rows of barbed wire fences like caged animals. After the initial rows of barbed wire fences were erected, we went on hunger strike to protest the incidents described above involving our brutal oppression at the hands of the High Commissioner and the local government. At the same time we’ve sent a protest letter to the UNHCR, the Malaysian government and the International Red Crescent Society to protest these serious inhumane acts violating human rights at the hands of the Malaysian government. Sir, above are just a few sketches of the essential details about our situation and the occurrences from the 23rd of January, 1995, until now. 7 ½ Miles Puchong 58200 . We are only asking you if you send mail to this address in Malaysia, please don’t put your organization’s name (on the envelope) just put some other normal-sounding address and ask them to hand it to me then I’ll be able to get it. I hope you will sympathize and understand the need for this subtlety. In closing, I pray to God to bestow blessings on you. If you need pictures or anything related to this then let us know and we will try to send them to you. We really look forward to receiving your response. We were a sea of colors with foaming splotches of pink, ebbing and flowing down the streets of D.C. Flown above our heads were banners carrying our pride, our hearts, and our conviction. All generations, from the age-weary to the sprightly youth, marched together. Families and friends, strangers and neighbors, we were united—we were driven. The energy on the morning of the Women’s March was palpable. I met up with Truong Nguyen, a Youth Coordinator from BPSOS, and PYD’s Tammy. We took the metro to the Gallery Place metro stop in D.C. On the train and right off of it there were march-goers left and right. Despite the cramped spaces and slow moving pathways, everyone was civil. We were brimming with an energy that could only be described as solidarity. We needed no map to find the crowds; it was all too clear where our route started. As we joined the march, there were protesters standing off on the sides, unwavering as they held their signs high. Women's March in Washington, DC. There were a lot of entertaining signs that made me laugh and delight in their wittiness. And there were also signs that turned my stomach and made me wonder how we can take two steps forward only to take five steps back. A churning anger and broken heart does amazing things in the face of adversity, and I saw it all there on that cloudy day in the streets of our Capital. I marched for myself, whose right to what I do with my body is in danger. I marched for my friends, whose right to love who they want is in danger. I marched for my family, whose right to be considered an American is in danger. I marched for strangers, whose encouraging strength reminds me daily of what it is to be human, alive and equal. Because we are all amazingly just skin and bones, blood and muscle, a mass of cells that refuses to be silenced at its very core. And I will not be silenced. As a woman of color, daughter of Vietnamese refugees, and someone who majored in social justice fields in both undergrad and postgrad, the election of Donald Trump was (and is) a nightmare scenario. Also, seeing the team he had assembled, I knew that the individuals in his administration would be even more dangerous than Trump himself. So disappointed and heartbroken right now. I can't believe so many Americans willingly elected a man who continually and unapologetically denigrates people of color, immigrants, refugees, women, the LGBTQ community, Muslims and other communities of faith, those who are undocumented, and more. Not only that, he thinks it's okay to physically assault women and to control their bodies, to use fear-mongering and hateful rhetoric as a campaign platform, to unjustly categorize people and openly and unconstitutionally discriminate against them. The America he envisions does not include me or so many of the people I know, love, and admire, not to mention countless in my community, my city, my state, and around the country. His America is not representative of the goodness and progress my idea of America embodies. The results of this election needs to remind us to love and respect one another more, but also push us to continue to protect and fight for civil rights and justice for all. This is not a time to sit back and see what happens; indifference is never the answer. Let's get to work. Over the next few days and weeks, there were protests all over the country, and my mom and aunt even attended the Hands Around Lake Merritt protest in Oakland, their very first protest ever. But the few protests I attended following the election were nothing compared to the Women’s March on Saturday, January 21, 2017. Sign: "Herstory has its eyes on you" - a feminist twist on a popular line in the Broadway musical, Hamilton. Women's March Bay Area - Oakland, CA. Julia & her sign. Women's March Bay Area - Oakland, CA. I went with some friends to both the Oakland and San Francisco marches, and while the number of people who came out exceeded all expectations, it was even more staggering to imagine that millions of people around the country were all taking to the streets at the same time. All day my social media accounts were flooded with pictures and videos of my friends who had went to march in their respective cities, and the sense of solidarity really inspired me to chant a little louder, raise my sign a little higher, march a little longer. Also, I loved seeing how so many people of all ages and backgrounds had come out to attend, even despite the steady onslaught of rain that drenched us in San Francisco. When I got home and turned on the news, to see the replays of the incredibly powerful speeches made and the aerial footage of all the marches, not to mention to find out that the Women’s March was the largest single-day demonstration in U.S. history, I felt so empowered and even a little hopeful. Even though so much has happened since the March, especially with the barrage of discriminatory Executive Orders and the filling out of a very racist and unqualified Cabinet, it’s undeniable that Trump is going to encounter a great deal of dissent at every turn. From the Muslim ban to the commencement of drilling at Standing Rock, from the building of the wall to the bills that propose reversing years of progress, from the attack on sanctuary cities to the spouting of “alternative facts,” we have to remain vigilant, to continue to fight for ourselves and for those around us. It was midnight after the election on November 8, 2016. I was grading student exams while talking with my classmates. I remember all of us sitting there staring at the election results map, on which the majority of the states had turned into a sea of red. The person who we wanted to represent our country had lost, and the man who has spent his campaign spouting hatred and discrimination had won. It was then and there that I ultimately felt threatened, devastated, heartbroken and divided. Never have I felt so alienated and threatened at the same time, and this is because the man many Americans have voted to be our president is someone who does not embrace people like me. I am a woman, a person of color, and a daughter of refugees and immigrants. I was not the only one who felt this way. Not too long after the election, my social media newsfeed and email filled with information about upcoming events like the Women’s March in Washington D.C. I knew immediately that I had to go, to stand up against what this administration stands for and to have our voices heard. Not too soon after that, other states throughout America and even different parts of the world decided to join the March in solidarity. On January 21, 2017, the day after the inauguration of Donald Trump, hundreds of thousands of women, men, and children of different backgrounds came to Capitol Hill, more than on the day of the actual inauguration. If there were any words to describe that moment in time, I believe it would be empowerment, perseverance and unity. That day, I made hundreds of thousands of friends. People of all races, sexual orientations and ages came together to march for causes and issues they believed in, including women’s rights, immigrant rights, LGBTQ rights, as well as many others. We all came into our nation’s capitol to make our worries, our fears and grievances, and of course, our voices heard–voices that this new administration has chosen to ignore, neglect and worse, to silence. Prior to the Women’s March, I had a conversation with a friend who asked me what was the point in going to a march or a protest. He believed it was useless because he felt as though we were all just going to crowd around the White House with no concrete or executable solutions. He felt like we were just children going into the nation’s capitol to whine and complain. I remember sitting there dumbfounded, and while I tried to articulate why it was necessary to come together to show unity and to stand up for what we believe in, my friend had already in a way silenced me. His opinion rang in the back of my mind for days and nights as I struggled to come back with a response. It was not until the day of the march when I was surrounded by kindred spirits that I realized my answer. In the midst of all different kinds of voices—I heard people speaking up, declaring why they needed to be respected as women and as human beings. I saw people advocating for women’s reproductive rights and for equal standing in the workforce. I saw signs of freedom being raised and parents carrying their daughters and sons on their backs, demonstrating the importance of protecting future generations. To see people of all walks of life advocating for one another, trying to break the paradigm of institutional racism, was a very powerful experience. My favorite memory is of a man with a sign stating that he was raised by wonderful women (his grandmothers and mother), married to a wonderful woman, and now raising a wonderful daughter. I also saw people raising signs to let refugees and immigrants know that America is their home too. Witnessing all of this, my friends and I could not help but be inspired that we need to be more proactive with our lives and how we want to contribute to society. Seeing these visuals of protesting and marches also brought me back to a crucial art history seminar I took in graduate school where we had a discussion on performance art, the grand procession of rituals and practices to showcase to an audience. These particular activities, according to anthropological theories, were created to bring forth something intangible and make it apparent, to make them visible. While marching, I saw the parallels between what I had learned in school with what I and so many others were trying to do that day - I realized why this Women’s March was so significant. We were transforming our beliefs and voices into a stage for all to see and ultimately, acknowledge.I thought about my friend’s comment and how he made this march, or the concept of marches, way too simplistic. Yes, he is correct in that our goals should have real change and yes, we may not have all the answers just yet. However, even if we do not have all the exact answers or resolutions, I still think we have made progress in taking the first steps. By coming together for the Women’s March, we let people around the world know about the issues that matter to us, and created platforms to start meaningful dialogue and actions. Not too long after the women’s march, I began to see other activists forming other protests for important issues like the march for immigrants and refugees, and the march for science. With this in mind, I also started noticing that some of my university's students, especially female students, have begun speaking up and stating their thoughts regarding the march itself, politics, history, and other subjects that would come up in our classes. They were no longer quiet about these issues. I find that empowering. We march to bring forth our ideologies of what it means to be equal – in this incredibly patriarchal society, this intangible, inalienable right for everyone to be treated equally needs to be recognized. The march itself was the physical manifestation of all these worries, frustrations, and even anger being materialized, and served as a trigger/tipping point by forcing the new administration and everyone in our country to truly reflect on their values, and become agents of change. Probably for the first time for many, like myself, the march was an opportunity to stop being a bystander and to get involved. Protesting is the first and necessary step to sparking social change, big and small. Since the start of the new administration, we have seen not only the Women’s March, but also the “I Am a Muslim, Too” rallies, the “Day Without Immigrants” protest, the boycott of Nordstroms, the school walkouts all over the country, and the filibusters on the Senate floor, but also the smaller but just as significant actions, such as the students at the University of Michigan standing to protect their Muslim classmates while they prayed, teachers engaging in sanctuary education workshops, and the deep and often difficult conversations across the dinner table. My friend’s point of view was too simplistic to recognize the ripple effects that happened leading up to, during, and after the Women’s March. As I marched with my friends from Capitol Hill to the White House and to the rest of the National Mall and downtown, I became more inspired and empowered to protect the people I care about. This march was literally our vow to protect each other. The Women’s March in DC was my first protest, and it won’t be my last. PYD is currently collaborating with Boat People SOS (BPSOS) Youth Coordinator, Trung Nguyen, and Vietnamese Studies Students at Southeast Asian Studies Summer Institute of University of Wisconsin-Madison (SEASII) on a summer project to go through a large archive of letters written between the late 1970s and the mid-1990s by Vietnamese Boat Refugees seeking asylum and/or family unification after the Vietnam War. PYD learned about these letters while interviewing Trung Nguyen (which will be posted at a later date). Wanting to know more about these refugees and their narratives, we have decided to use this summer as a chance to review the letters, many of which tell stories of those who were involved in and affected by the Vietnam War. Moreover, the majority of the content includes pleas to countries including the United States, Hong Kong, Japan, the Philippines, and Australia for asylum due to political and religious persecution back home. While most of the letters were written in Vietnamese, which the SEASII students have graciously volunteered their time to translate, we do have many that are already in English. We will be uploading some of these letters (with the permission of BPSOS) onto our Art Submission gallery! We would like to take the opportunity to publicly thank BPSOS, Trung, and the SEASII students for all their help! We are very grateful for this opportunity to be able to read through these letters and get a first-hand glimpse at this trove of primary documents. We believe that these documents can help shed a light on a part of history that has not really been explored in depth yet, as well as provide more information to the research on the Vietnam War. Stay tuned for updates on our progress! One of our favorite images from the Conference's photo booth. From left to right: L.N., J.N., T.T., and H.N. Missing but with us in spirit: J.H! Please note that J.N made that poster for us! We forgot to print one and she saved the day by making it! It'll always be our first and foremost awesome sign! The Mid-Atlantic Union of Vietnamese Student Associations (MAUVSA) Conference is an annual event over a spring weekend where VSAs from universities all over the United States can come to network with one another and prepare for their future careers. Over three days, the attendees enjoy workshops of their choosing, meet members from different schools, and are treated to a formal with a 10-course meal and entertainment. For many of the attendees, the best part of the conference is the opportunities to meet new friends and network with potential employers. As a former VSA board member of George Mason University's (GMU) chapter, I've seen the impact of MAUVSA on GMU's members. Many new members will attend from the urging of upperclassmen, but they never regret that weekend. And I can easily say the same about my own experience, even for just an hour during the networking event. Project Yellow Dress had reserved a booth during the networking event that Saturday, February 27th, of the 5th Annual MAUVSA Conference. T.T. had already set up the booth when I arrived with a poster hastily but lovingly made. Although we are a new platform, we are enthusiastic and determined by our mission. 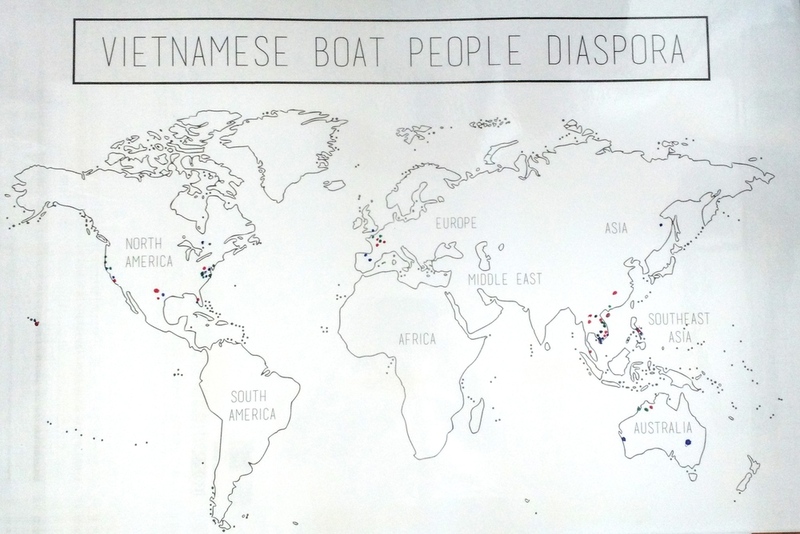 It is important to remember that these maps only represent a small population of Vietnamese/Southeast Asian families. And yet, look at the spread! One of the U.S. populations that surprised me was Michigan. I had no idea that Michigan had Boat People there. It was T.T. who explained to me that the reason for this was because of the Michigan Refugee Center. Even now, with the Syrian crisis, Michigan remains a huge supporter of aiding refugees. One of the best surprises was meeting Trung Nguyen, a youth program coordinator with Boat People SOS (BPSOS). Before the start of the networking event, T.T. and I had talked about eventually reaching out to the organization, so it felt like fate that we'd run into a representative of theirs. A little fun fact: They are based in Falls Church, Virginia, where Eden Center (considered the hub of Vietnamese restaurants and shopping) is located. That explains why there is a Vietnamese community in Falls Church. Overall, the conference was a huge success. We gathered such interesting information and stories from the people we met. I'm excited to perhaps interview a few for a more in-depth perspective of their stories and how their lives have been shaped by their parents'/their journey as Boat People. Theresa Hoang from GMU's VSA filling out the USA Diaspora Map. As J.N. pointed out, this MAUVSA Conference was one of PYD's first networking experiences. MAUVSA Advance Conference Co-Executive Director, Tiffany Nguyen, told J.H. and I that we could have a booth during the networking fair. We were both so excited that we talked on the phone like crazy. We began discussing what we really wanted to promote and how we should decorate our flyers and bookmarks. Once J.N. joined our team, it was even merrier! As mentioned earlier, one of the biggest interactive parts of our project was the diaspora maps. We loved how engaged people were with the maps as they tried to locate where their family members currently are in the aftermath of the war. It made each and every one of us very reflective of where we are today and how far we've come along as a group of people and as a group of individuals. In the process of people mapping out their family diaspora onto the map, J.N. and I began hearing wonderful (and heart-breaking) stories of people's families escaping after the Vietnam War (many of the students and alumni of VSA who came to the fair were also sons and daughters of Vietnamese Boat People). Many also shared the same feelings as PYD in regards to how little these stories are known. Many did not know about their parents' and grandparents' journeys from Southeast Asia until they were a lot older when they began to question certain things like identity, history narratives, or institutional teachings of the Vietnam War. Overall, PYD's first networking session was very successful because we met all kinds of people from all over America. Not only that but we also met other people who are working on similar goals and missions as PYD (Bars for Blogging, Boat People SOS, Project AVA). We even reconnected with old friends from VSA/college and made new ones, which is always great! Essentially, it was wonderful to see everyone sharing their stories so openly and passionately, and we can't wait to receive more new submissions soon! We hope PYD will grow further some day and become a platform to preserve all these lost voices and to inspire future ones!